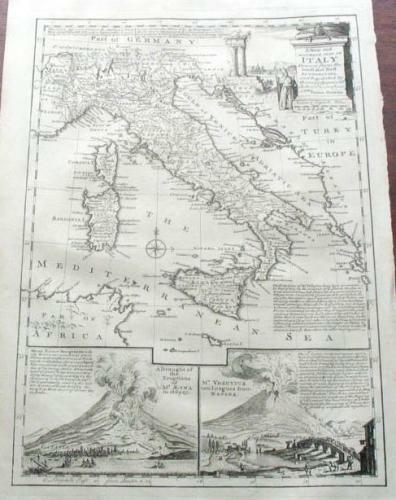 Title: 'A New and Accurate Map of Italy...' from Bowen's A Complete System of Geography, printed in London in two folio volumes in 1747. Handsome map with all of Italy and insets of Mounts Aetna and Vesuvius. Emanuel Bowen (1714-1767) was mapmaker to King George II and Louis XV (France), and his magnum opus is the System of Geography from which this map came. The condition is very good, minor loss to the left corners, light marginal soil, right edge a little close to plate-line.